If you have a Facebook page, it is important to know how it performs. Luckily Facebook has a free in-built tool that can help you with this called Facebook Insights. You do not have to be a technical genius to get something really valuable out of using this tool. 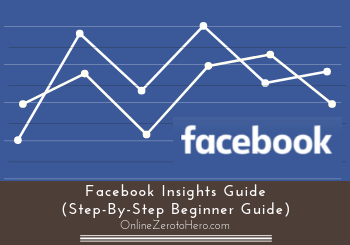 In this Facebook Insights guide for beginners, I will show you, how you can easily use it no matter your technical skills, and show you how to do it step-by-step. Facebook page insights is a free tool that is an in-built part of Facebook. It is a way to get data and statistics about how your Facebook page is performing. This is only a tool that is relevant if you have a Facebook page, meaning a page for your company, product, brand, blog, or similar. It is NOT a tool that can give you data about your private Facebook profile. Statistics and data does not have to be complicated. You can get a lot out of just knowing a few important tips and tricks, and this is what I will show you in this article, so you can get started easily. Be aware that there are many paid tools for Facebook analytics and statistics as well. The official Facebook tool is free, and it is great for a start, so no need to go out and spend money on a tool from the beginning. So why should you even use Facebook Insights? There are many good reasons for this. If you do not have any data, it can be difficult to know how you are doing and what effect your promotions have. Of course you can have a sense of it, but this is often not good enough. Having data can help make important decisions and help improve your overall performance. Without at least a little bit of statistics and data, it will often just be guesswork, and it will be difficult to see, if your decisions are good, or if you have to adjust. This has become even more relevant after Facebook in 2018 announced a big Facebook algorithm update, as this means you have to be even more aware of how people interact and react to your content. All this will help you create better content and connect better with your audience. This will help you improve your overall visibility on Facebook, and all this can help you grow your business. To be able to access Facebook Insights, you need to be administrator of a Facebook page. Once you are this, it is very easy to get access. You just go to your Facebook page, and at the top you can see a tab called “insights”. You get access to FB Insights at the top of your page. Once you click here, you will get access to the Facebook Insights dashboard and overview. Now it is time for the Facebook Insights tutorial – this will give you an overview of how to find and use some of the main features this tool offers, so you can easily get started. Before going through how to use Facebook Insights, I just want to mention one important thing. When it comes to online marketing in general one thing is very important – testing! To improve your results, you need to keep testing. This also goes for Facebook. When you test, and then see how you test goes by using statistics, you will know what works and what does not work. Do not expect that everything you post or promote will become successful right away. Do not let it upset you, if it does not – it is perfectly normal. Even the most successful online marketers and big agencies do a lot of testing and fails often. So be prepared to test, and learn from what is working and from what is not. When you first come to Facebook Insights (as showed above), you get to an overview. Here you by default get data for the last 7 days. 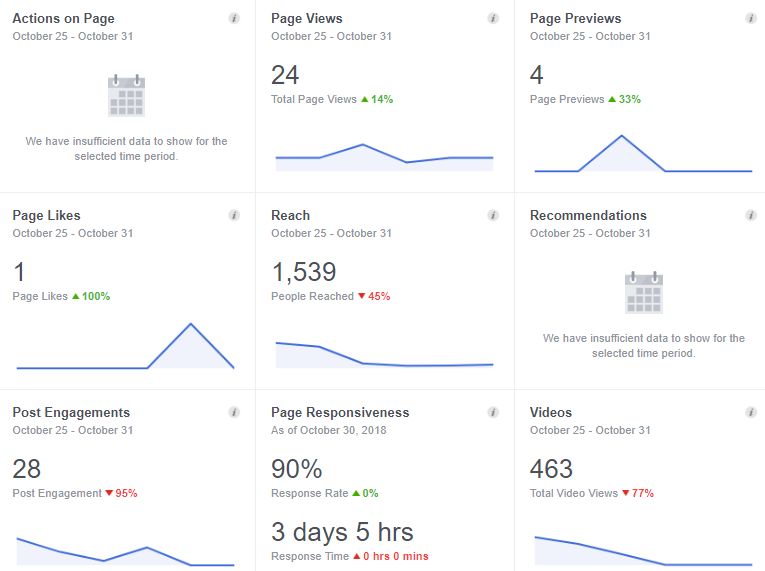 The Facebook Insights dashboard gives you a quick overview. This is a great way to get a quick overview of for example new likes, interactions, how many video views, etc. It is not alone enough to get a deeper sense of what is going on, but is a great way to get a quick sense. To get further data about the section you want to know more about, you either click the section on the overview or click in the left-hand menu. By hovering your mouse over the small icon in the corner of each field, you can get a quick explanation of what this data shows. Hover you mouse over to get a quick description of each section. 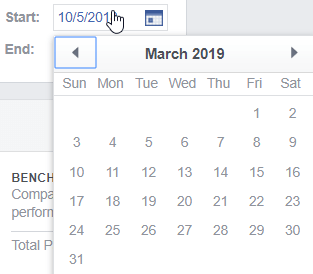 This can be used throughout Facebook Insights, so remember to use this option to get a quick idea and reminder about what a certain data point is about. One of the important aspects to look at it is page likes. This is a great indication about how well your site is doing. You can use this data to get knowledge about your overall growth, and understand where it is coming from. However, too many people are also solely focusing on this, and forget to look at the bigger picture and the connections. So do not obsess only about the number of likes. Combine this info with the rest of the data. Where your page likes happened. The total number of page likes is kind of self-explanatory, as it says how many likes you have in total, and how it has developed. The net likes shows you the number of new likes minus the number of unlikes within the given period. Net likes shows how many likes you have gained and lost. This can be very useful to keep an eye on. If you for example suddenly have a big minus or plus, check what you posted around that time. Maybe you posted something your followers did really not like, or you posted something that people shared a lot, and you got a lot of new likes. Then learn from this and use it in the future. The last section shows where the page likes happened. So here you can see if it happened directly on your page, in the news feed, from a Facebook search, or from ads. At the top of this section, you can adjust the time period and select the exact period you want data for. You can adjust the date to see data for the period you want to. This can be adjusted in many of the sections throughout Facebook Insights. The next important section is the reach section. This gives you an overview of how many people have seen content from your page, and how they have interacted with it. This sections can give you a lot of valuable information about how people like your content, and what kind of content is the most popular. A lot of positive reactions is very good, as these kinds of reactions sends a signal to Facebook that you have great and relevant content, and it can therefore help increase your organic reach (non-paid reach). The Facebook reactions can help you see what works. On the other side, if there are a lot of negative reactions, it can have the opposite effect. This section is therefore a great way to keep an eye on a lot of negative or positive reactions. This can help you get a lot of knowledge about what people react negatively or positively on. Use the knowledge in your future content and promotions. It will help you create better and more relevant content, and help you get more organic reach. The next section is the “page views” section. This gives you an overview of what parts of your page people have seen. Meaning how many have seen the about section, reviews, photos, etc. This is a great way to find out what parts of your page people find the most interesting. Also, if you for example see that many people visit the photos section, but you do not have any new and great photos, then it might be worth considering doing something about this. You now know that a lot of people look at this section, so you know it will be worth it – this is just one example of how you can use this info. In this section you can also see who has viewed your page divided into age groups, gender, country, city, or device. You will also find information about where people came from – meaning if they came from Facebook, from a website, or what the source is. This is all great information to get to know more about your visitors. Getting to know your visitors can help you connect better with them and create more relevant content for them. Videos are an important part of getting people to interact. People love videos, and by using them you can gain a lot of traction. You of course need to know how well your videos are performing, so you can learn from this and adjust accordingly. Luckily Facebook Insights has a section with video insights. You can see how well your videos are performing. You can here see how many minutes each video has been watched, and how many videos have been watched more than 3 seconds. Use the knowledge to find out what kind of videos work, and which ones people do not find interesting. Then use this to improve your videos in the future. As I said in the beginning of the tutorial section, testing is an important part of creating good results. So see it as test every time you create something and keep learning from it and keep improving. Post engagements is a section with a lot of great info you can use to optimize your communication. You can for example see what time of the day your followers are online the most. It can be very useful to know, when most of your followers are online. This can be used to mostly post when they are active, as this increases the chance they will see it and interact with it, which in turn can help increase your overall reach. You can in this section also see how people interact with each of your posts – you can see how many likes they got on your page, on shares, what kind of reactions, comments, and more. This will help you understand how each post connects with people, and you can use this to optimize your future posts.